For our impromptu party, which started out as a playdate for my son which happened to be on my birthday when we checked dates…and grew to a few more friends and kids, I baked these delicious scones, so quick and easy you almost can’t believe they’re done quite so soon. I can hear “Traditionalists” screeching in horror and turning in their graves at the fact that these include cream and lemonade among the ingredients, but honestly, please try them. I find that they are best eaten just after baking or at least the next day, but if you can’t find it in yourself to gorge them all within this time frame, they are still tasty and fresh up to about 2 – 3 days after baking, provided you’ve kept them uncut and in an airtight container. Combine the lemonade, cream and flour together to form a soft dough. It may be quite wet, but this will rectify when you knead it. Knead gently on a floured surface and roll out to about 2 – 3 cm in thickness. Either cut out using a round cookie/scone cutter or cut into squares (I prefer round dainty scones). 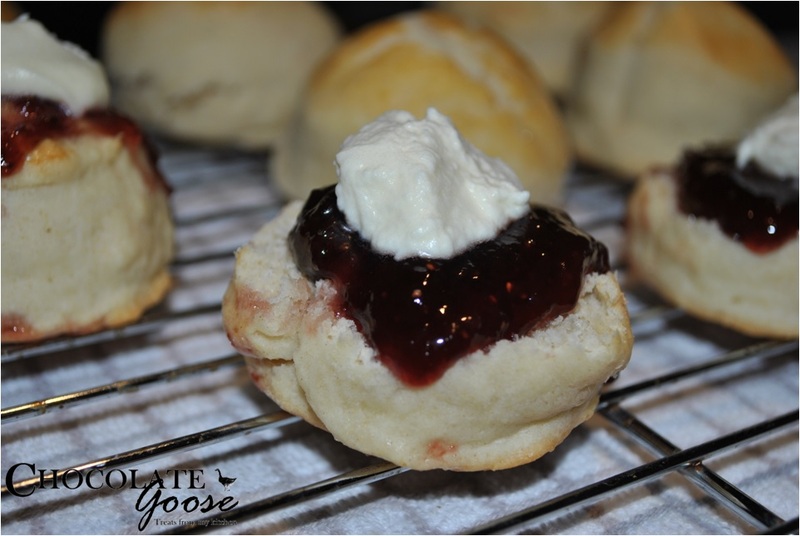 Place relatively close on a baking sheet and brush the top of the scones with beaten egg to give them a golden top. Bake for 10 – 15 minutes until golden. Remove from the tray and allow to cool on a cooling rack. Spread on a thick layer of jam (you can add butter first if preferred) and then a generous dollop of freshly whipped cream. Now pop one in your mouth before arranging the rest neatly on a serving platter. They taste as good as they look. Thanks for visiting my blog! Hi there, I am making 200 of these for a fundraising Devonshire Tea. I would prefer to make them fresh on the morning of the fair as they taste just great fresh. Is it possible with these ingredients to have them made and on covered trays the night before and just cook on the morning . I can try but just wonder if you have ever done this? Hi Jeanette, thanks so much for visiting my site! I haven’t tried preparing them before hand as you suggest so can’t honestly answer you with any conviction but my personal preference and gut feeling is that it would be better to just make them fresh. Lots of work on the morning, I know, but I wouldn’t trust the lemonade ingredient to still do it’s trick. They may be a bit flat and lack the lovely texture. I’d love to know if you end up trying this and how they turned out. Good luck!